The French film stars Arnaud Henriet, Jeremie Elkaim, Naidra Ayadi, Nicolas Duvauchelle, and Joey Starr. NEW YORK — Even for a fly-on-the-wall observer, the child protection division of a police squad is not for the faint of heart. Just ask the single-named French writer-director-actress Maïwenn. As part of the research for her third feature film, “Polisse,” which captured the Jury Prize at the Cannes Film Festival last year and opens on Friday, Maïwenn spent a psychically grueling several months embedded with the detectives in the Paris Child Protection Unit. Every day, the officers grapple with cases of child abuse and pedophilia. Maïwenn, who dropped her surname, Le Besco, not only got a first-hand glimpse of the emotional wringer endured by detectives, but she also witnessed the toll that those cases exact on the officers’ personal lives — an effect she experienced up close. 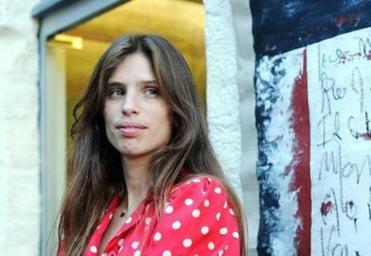 Former child star Maïwenn directed and co-wrote “Polisse,” which won the Jury Prize at the Cannes Film Festival last year. Chicly dressed in jeans and a luxe asymmetrical pullover, Maïwenn is an exotic beauty, with a broad mouth, pillowy lips, and long, wavy chestnut-and-blond locks. As the conversation unfolds, her initial prickly reticence melts into a charming and effervescent give-and-take. “Polisse,” with its raw and gritty naturalism and bracing immediacy, eschews the formulaic tropes of TV police procedurals like “Law & Order: Special Victims Unit.” The film racked up 13 nominations for the César, the French Oscar equivalent, and became a bona fide box office hit in France. But it divided critics at Cannes despite nabbing the Jury Prize. Some compared it favorably to the landmark HBO series “The Wire,” praising its loose episodic structure, vivid mix of characters, and cinema verité-style realism; others accused it of maudlin overacting, wild turns into melodrama, and a lack of coherent focus. While “The Wire” explored the ways that institutional decay crushes individual initiative, “Polisse” only glances at bureaucratic degradation, largely training its lens on the emotional strain of the job and the stress that the cases put on the officers’ splintering home lives. Maïwenn, who plays the part of a government photographer embedded within the unit, says that all of the cases in the film were inspired by actual situations she witnessed or heard about during her time at the CPU. But none of the characters, she insists, is based on real people. She also says that, despite the film’s gritty, true-to-life feel, the group dynamics and situations are “romanticized” to some extent. In bringing the script to life on screen, Maïwenn worked hard to find the truth of each scene, sometimes using on-set improvisation — even if the script had been already developed by her and screenwriting collaborator Emmanuelle Bercot. Maïwenn insists that “Chick Pea” was the first artistic endeavor that truly came from her soul and it boosted her confidence. But it was her foray into filmmaking that allowed her really to spread her wings and combine her varied creative interests, from writing and photography to acting and overseeing the design. Yet when she attempted to make her first short film, she struggled to find her voice and ended up with “an academic” film that left her disappointed. Not long after, she starred in Claude Lelouch’s “Les Parisiens” and “Le Courage d’Aimer,” and she saw a looser, more freewheeling approach to filmmaking, more in line with her own sensibilities.